OAKLAND — Andrew Bogut admits he has gotten more sentimental as he has aged. The first time he checked into Oracle Arena as a Warrior, he was part of a late-season trade in an otherwise lost 2012 season. Over the next three years, he became part of the fabric of the organization and its youth movement. Bogut helped facilitate the team’s commitment to defense — which Steve Kerr praised Thursday — and watched that transformation culminate in Golden State’s first NBA title in 40 years. One year later, he was part of Golden State’s 73-regular-season-win team that fell short in the 2016 NBA Finals. Bogut hasn’t enjoyed the same triumphs since. In the past three years, he has bounced around three NBA teams, battled injuries, and returned to Australia, where he was named the league’s MVP earlier this year. Since Bogut returned to the Warriors last week, he has been welcomed — among the team, fan base, and Bay Area — like a long-lost friend. 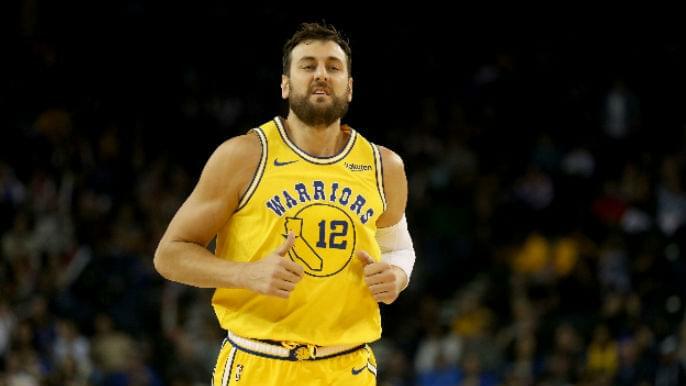 Prior to Golden State’s 112-89 win over the visiting Indianapolis Pacers Thursday, the Warriors displayed a video compilation on the overhead scoreboard dedicated to Bogut, with Kanye West’s “Homecoming” playing in the background. Bogut smiled and waved to thunderous roars. Once he checked into the game at the 1:46 mark in the first quarter, the ovation returned. On Thursday, Bogut played his third game in a matter of four days. He started his first game back and produced a line of seven points, seven rebounds, and a steal in 19 minutes. Bogut played just nine minutes Thursday night, but he snagged seven rebounds and contributed to one of Golden State’s best defensive performances of the season. Steve Kerr has raved about Bogut’s fitness and overall play, despite him returning to an “insurance-policy role” with DeMarcus Cousins returning from a two-game rest. Bogut still has a role nonetheless, one that could potentially include meaningful playoff minutes when Cousins rests or gets in foul trouble. For Bogut, who helped start the dynasty that has swept the NBA, helping the Warriors win their fourth title will complete the full-circle experience.